People have taken drastic and sometimes desperate measures in order for them to look younger and this of course includes going under knife. In reality it does not have to be that way, you do not have to go through all that pain and suffering to achieve the desired results. There are alternative methods that you can choose to do that will provide you with the same effective results minus the cost and risk but at the same time you will also benefit as your health will also improve. Stress can affect you in many ways as some of you will attest to, so that is why whenever you are under a great deal of stress it is important that you manage your stress well and always keep a positive outlook on the particular matter that is bothering you. If you are not able to achieve this, the stress will wear you down both physically and mentally so it is vital that you keep it under wraps in order for it to not show on your body. If this situation arises the best thing to do is just relax and keep yourself focused, take a few deep breaths so that your head is clear. This way you are more likely to get through the problem in an efficient manner as compared to running around with no clear direction in what you are doing. It is best recommended that you include a wide variety of colorful vegetables and fruits in your diet. Recent studies have shown that in a day you should eat vegetables and fruits from 8 different types of colors. What gives the fruits and vegetables the color is the nutrients that are contained within them, so they are natural coloring that is healthy for you and you get rest assured that you will be getting all the essential vitamins and minerals that your bodies need in order to function properly. If you have a personal vendetta against drinking water then you should definitely reconsider your stance on this particular topic. If you have the habit of reaching for that soda or sports drink when you are thirsty then quit that habit, all these beverages may claim to help in some way but in reality we as consumers only believe in them only because of aggressive advertising. Drinking 8 glasses of water a day will be more beneficial to you as opposed to drinking 8 cans of sodas (which in fact will do you more harm). Drinking water will keep your skin hydrated, this will result in the reduction of fine lines and wrinkles as your face is plumped up. Exercising will not only be good for the general well being of your body but believe it or not exercising will also give you that youthful glow. So your aim should be to do a cardiovascular workout for about five times a week, and this should take about twenty to thirty minutes. You should also add strength training to your exercise regime and do that for about three to four times a week. Get enough sleep. Most people need between seven and nine hours a night. To properly calculate what you need on a week off from work, fall asleep and wake up naturally. Include foods containing omega-3 fatty acids. Good fats help keep skin plump and looking young. Drink water. Water keeps your skin hydrated which helps plump your face up, thus reducing the appearance of wrinkles and taking years off your appearance. Apply makeup skillfully. You can give yourself an instant face lift by applying blush high on the cheek bones, followed by a thin layer of gel blush. Lips lose their fullness with age, so after applying lipstick add a touch of gloss to the center of the bottom lip to create a plump look. Exercise to keep a youthful glow. Aim for cardiovascular workouts about five times a week for at least twenty or thirty minutes and strength training three to four times a week.  Yoga can help reduce stress and provide you with exercise benefits and flexibility.  Aim for nine servings of a combination of fruits and vegetables per day.  If you can’t get enough vitamins from your food, try supplements to help.  Don’t try to put on more makeup in an effort to look younger. This will only bring more attention to flaws.  No tanning beds! 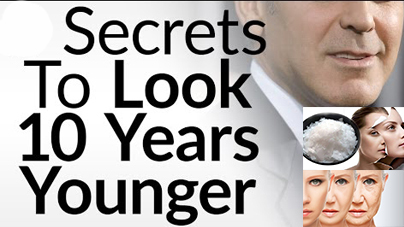 Not only will you increase you skin cancer risk, you will also age yourself quickly. If you want a tan look, use self tanner.